VooDoo Zip line will make Slotzilla look Childish, the starting platform is 50 floors up. The ride will cost 25 dollars in the daytime and 37 at night. The extra 12 dollars for night might be well worth it since the Las Vegas Strip will be easier to see then. 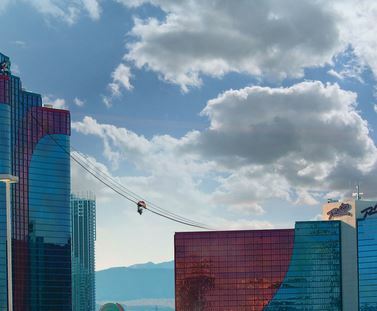 If You are one of millions that doesn’t care for Downtown Vegas (Stay away from downtown) then You should be glad to hear of Las Vegas’ second Zip Line just west of the Las Vegas Strip at the Rio Hotel and Casino. The VooDoo zip line runs from the VooDoo restaurant on the 50th floor to the 30th floor on the opposite tower. The ride last 70 seconds, yes, just 70 seconds but it will feel like forever. Breath taking views of the Las Vegas Strip will be unmatched from this height. The views will be similar to the Linq HiRoller but at a much faster pace and from the west instead of the east.